Comes A Soldier’s Whisper is an intimate account of the letters of David Tharp, a member of the 101st Airborne Screaming Eagles, to his sweetheart, during World War II. Written between 1943-1945, they chronicle the growth of a young man into a war-hardened veteran, without the loss of his mid-American values or love for family and friends. La Sala provides enough notes throughout the book to explain military jargon; and the multitude of black-and-white photos illustrate the people and locales that provide reality to Tharp’s journey from his Midwestern home, to Normandy, and back again. “Whisper” is a first person experience of war and a love story with a happy ending. 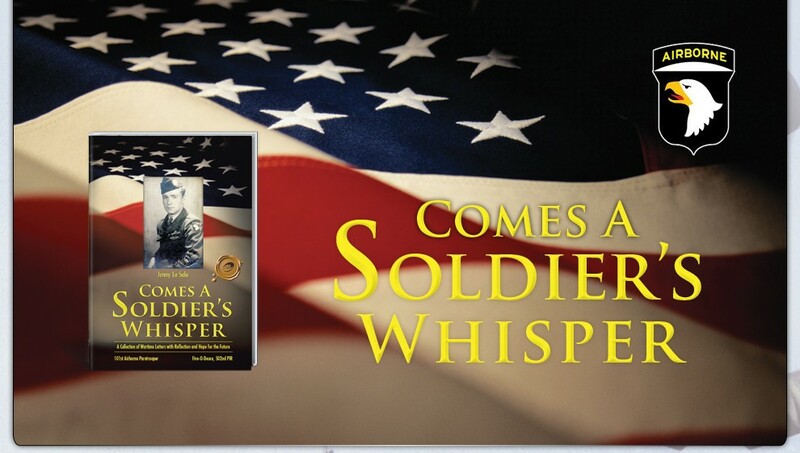 For those who relish an intimate account of one man’s hope for a future realized, Comes a Soldier’s Whisper is a nice addition to your book collection. I lost 4 uncles in WWII. I never had the chance to meet them but my mom's stories kept them in my heart. I will always give honor and thankfulness to all veterans of war and to those who continue on fighting for our freedom and our constitution. A few of my most precious "relics" are four wartime letters. Two were written by John W. Walker (who was raised along with his brother by my great grandmother) and two written by Ben Shown. Both were in the 27th Infantry Division, in the same squad. Shown was the squad leader and Walker was his scout. Both were wounded in the Battle of Saipan. Walker was wounded first on their 3rd day of combat and received the machine gun across both thighs and his left buttocks. Ben Shown was wounded two days later by shrapnel in his bicep from an exploding mortar round. Both were aboard one of the hospital ships, and my letters (written to my grandparents) are all post marked from the ship. Both men came home, both were extended family, uncle's by choice rather than blood. We buried John Wade Walker 23 years ago and Ben Allen Shown in April 2012. My name is Dawn and I also have the Facebook page "Moms of Those Who Serve." I just wanted to say what a wonderful book you wrote (haven't read it yet). I have some similar letters between my parents that they wrote each other before they were married. My dad was in the Air Force and stationed in Okinawa - post the Korean War. I haven't even gotten through all the letters there are so many. But what a treasure! There are two years worth. I have wanted to do something similar as you, at least have them organized for my children and their children. My son served in the Army in tow tours to Iraq. He died in 2011 here at home, PTSD related. We are very proud of him and his service. Miss him so much. We also have a son in the Coast Guard. He is currently in North Carolina. Our oldest is our daughter who lives not too far away. Anyway, I just wanted to drop a line to say hello and send a friend request. I think your book will be wonderful to read and like you said..."tell a soldier's whisper and help to bring healing to those who serve and their families." With that, I say, "thank you." "I THOUGHT IT WOULD BE QUIET AND PEACEFUL WAY TO GO. IT TURNED OUT TO BE ANYTHING BUT THAT." This posting on Comes A Soldier's Whisper facebook today was very coincidental. My dad was just talking about Walter Cronkite and his trip on the glider three nights ago. Seems troops held on for dear life during the glider landings. One arm to brace themselves , the other to hold on to their rifles. Their helmets often went flying. Supposedly Mr Cronkite picked up a helmet after landing, got out of the glider and many troops started asking him what his orders were. Seems he had a helmet on his head with a star on it. So the troops thought he was a general. Just finished your book, Comes A Soldier's Whisper. My father, PFC Leo Martin, Co C 502nd PIR, has the same medals/ribbons as yours, wounded at St. Odenrode also, both at Holland and the Bulge. They had to be at the same places seeing the same things... and I sure would think he would have the same feelings your father did as written in his letters. You and I have a deep desire to not let what these men did be forgotten. amazingly, my father did not talk much about the war, never attended reunions and such, but he re-enlisted after the war and served 20 years. Thanks for what you've done in sharing your father's experiences and feelings. Comes A Soldier’s Whisper by Jenny La Sala is a journey into the transformation of a young American “country boy” of 18 into a battle hardened paratrooper of the 101st Airborne Division. Jenny has collected the letters of her father, David Tharp, which he wrote to his sweetheart, whom he later married. The letters are personal and telling, but not too telling. What is noteworthy is what David left out of his letters, so he would not upset his girl. However, the enthusiasm of the early letters is replaced by the war weariness of a soldier who has seen much combat. David Tharp changes from an optimistic young man to a man whose psyche is much older than his chronological age, due to the horror and suffering he has seen. This book gives a true insight into the effects of war on the Greatest Generation – a generation that has been thought to have been immune to trauma. Unfortunately, men like Jenny’s father and my 82nd Airborne WWII father, were not given the help upon return home. Some functioned well, and some did not. But we need to recognize that soldiers from WWII were just as impacted by combat as those of subsequent generations. Thank you to Jenny La Sala for sharing these eloquent and insightful war time letters of her father. A book worth reading.. I want to thank you and your husband most sincerely for the visit you made to the Indiana Military Museum in September. I'm glad that your impression of our museum was so positive. Your book, COMES A SOLDIER'S WHISPER is a wonderful assembly of letters which reveal so much about personal feelings as well as the historical events going on around your father during the war. Things like some of your father's letters would of course be great educational tools and great personal mementos for our visitors to see. So certainly by all means, we would like to have some of your father's original letters on display in our museum. The Tom Brokaw endorsement of the book is absolutely fabulous. I sure wish we could get Tom Brokaw to see the museum here one day. I think he would be astounded at what we have been able to do and what we are continuing to do. Wednesday. Indiana native La Sala was sharing her collection of her father David Clinton Tharp's very personal WWII letters to his sweetheart, and later wife, Betty Lou. Sitting in the small, but appreciative audience was Williamson resident Ray Pessin. He felt very connected to La Sala, as a boy of ten he was lving in his native province of Normandy, France and was about 25 miles from the site where La Sala's father landed when he jumped into France on D-Day, June 6, 1944.
duty and sacrifice.” Having “silently shaped and molded me, “ she published the letters in a COMES A SOLDIER'S WHISPER earlier this year, lovingly dedicating it to her father David, and brother David, who both served in the 101st Airborne. der (PTSD) suffered by many veterans. transition organization shepherding veterans from war back home again. La Sala's book has generated many wonderful people connections; her Face-book page has over 6,000 followers. "People want to learn about history and this book is to help start a dialogue about war," she reflected. Next year, she hopes to publish a second book that contains not only her ex-husband's letters but interviews with veterans from all wars. Entitled Comes A Soldier's Whisper VIETNAM and Beyond, this book will again reinforce the notion that "memory never recedes," and provide another bond with the taste, sights and sounds of history, so memorably captured by author and daughter, Jenny La Sala. Some years ago I reviewed a book about a soldier from Illinois. The book was a collection of notes and letters and the ephemera of his life as the recipient of the greatest award for gallantry the British Empire could bestow. The plain fact is that, as a book, it was beyond conventional review – it was a celebration and the truth is I’ve seen nothing like it since until I read COMES A SOLDIER'S WHISPER remembering the life of the paratrooper David Clinton Tharp. Although completely different in format the spirit of the book is identical. Here we have the letters a young soldier sent home through the period of his training at Currahee and embarkation to England. We see him in Normandy, the Netherlands and the Ardennes before he finishes his war in Austria during the chaos of the aftermath. The letters themselves can be taken at face value in terms of emotion and impact. They are effectively a statement of the life of an ordinary soldier. They offer up a private world and editing them must have been a challenge for his daughter when preparing this monument to her father. He self censors the nightmares of his life as a cog in the vast wheel they like to term the Greatest Generation. As a radio man in the 502nd PIR he is indelibly tied to the aura of the war time Screaming Eagles. If the 101st were a brand in the modern sense they would be Apple. We can’t get enough of them. Here you have just one man of thousands and yet, for all of them, he is an everyman. If you are attempting to build a complete picture of that division or the Five-Oh-Deuce or just an ordinary American soldier, far from home; this book is invaluable. The book won’t enhance your knowledge of the war or make it any more real for you than watching another re-run of Band of Brothers. But it has something not to be dismissed. It is a strong link to the men who fought for us. If you are lucky enough to possess the wartime letters of your own nearest and dearest you will understand this completely. They are to be treasured. They are your history. David Clinton Tharp returned home to a full life of all the domestic stuff he craved while away on what was his greatest adventure. It defined him like so many others and he left us quietly just like my infantryman dad and your grandpa and it is entirely wrong to say that was all he wrote because in every sense he’s still here and this book cements his memory. This is more than a review, it is a celebration.